Herb of the Month has re-emerged from winter hibernation! 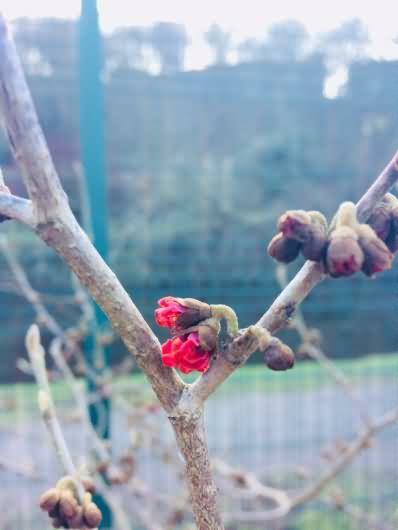 And in the cold, muddy January garden, one medicinal tree is already brightening the gloom with its blossom. This is witch hazel: one of three witch hazel trees growing in skincare bed of our apothecary garden. The others – a fiery red-blooming variety, and an orange – are just starting to blossom, a little bit later than the yellow, promising even more colour in this corner of the garden over the coming weeks. Varieties of witch hazel grow wild across America and Asia from Mexico to Japan, but the particular variety we use for medicine is Hamamelis Virginiana, native to the Eastern part of the North American continent. As a remedy, it has been used by the indigenous people of those lands since long before Europeans arrived. The Mohegan people also used to use the twigs of this tree to dowse for water, and showed British settlers how to do the same, which gives us its English name: ‘witch’ from the Anglo-Saxon ‘wych’/’wice’ meaning ‘pliant’ (like ‘wicker’) because the twigs are supposed to bend towards underground water sources. Beautiful as they are, the blossoms of the witch hazel are not where most of its medicine is found. The leaves and the bark, and especially the twigs, are the parts gathered and used by herbalists. 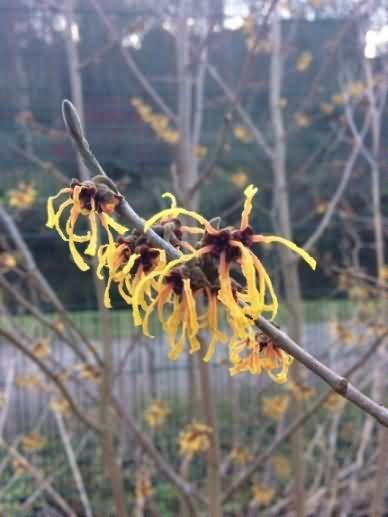 The tips of this magical tree are full of astringent tannins, anti-inflammatory and capillary-strengthening flavonoids, and cooling volatile oils – properties which make witch hazel an excellent first aid remedy, and a valuable ingredient in skincare. When extracted in water, the astringent properties of witch hazel help to stop bleeding and close wounds. Witch hazel compresses – cloth soaked in witch-hazel water – can be used to treat cuts, nosebleeds, varicose veins and haemorrhoids. Its cooling, anti-inflammatory and capillary-strengthening properties also help to remedy bruising. For cosmetic purposes, its astringency helps to reduce the appearance of pores, and its anti-inflammatory properties soothe redness and inflammation. Tired, puffy eyes will often benefit from a bit of witch hazel water on a cotton pad. 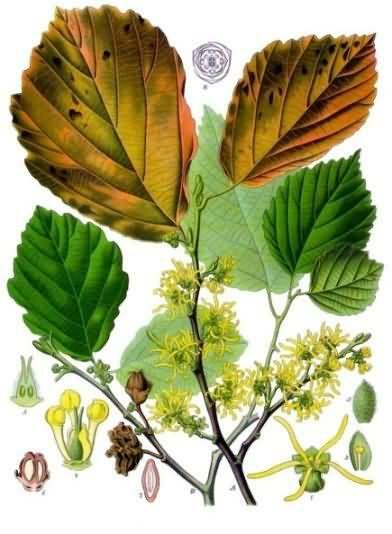 Traditionally, witch hazel was also used as an internal remedy: the Iroquois would make an infusion from the boiled twigs of the tree, to treat dysentery and diarrhoea. This is not recommended anymore, because there are so many other astringent herbs which can help with diarrhoea while being much gentler on the stomach (and, as always, please see a doctor if you are feeling really ill – especially if you think you might have dysentery!). Our little apothecary garden trees are probably too small for us to harvest their bark, but you can buy dried witch hazel bark from good herbal medicine suppliers online. It is very easy to make your own witch hazel decoction by boiling the leaves or the bark in fresh water: the resulting liquid can be used with a clean cloth to make compresses or poultices for healing. For most purposes, though, you may find it easier to buy distilled witch hazel water, either cosmetic-grade or concentrated. Both are available locally, here in Todmorden, and both are valuable additions to the first aid kit. Dab it straight onto minor cuts, bites and stings; use it to make a compress for bruises and sprains; and splash it on your face when your skin needs refreshing. And see if you can find time to visit these trees while they are still in their full winter bloom.